With my Zara satchel already falling apart at the seams, I think it might be time to get my act together and saving up my pennies to get myself a Mulberry Alexa. In my dreams hey! Might have to settle for a Cambridge Satchel instead! Theres something about real leather bags I can't get enough of, I eye this up every time I go into the Mulberry store and think "If only…"
Oh wow its gorgeous ! If I had the money..
You know, the Alexa is one of the only things I've never actually fallen for despite its prominence! It's definitely a classic, though I definitely prefer the Cambridge satchels. I'm saving up for one right now, haha... just can't decide between black or white! This is gorgeous - I'm also in love with the Del Ray and the Travel Day Bag as well! Gosh this is lovely, fingers crossed that I win the lottery! This is my dream but I'm after a brown one.. When Im rich and famous! 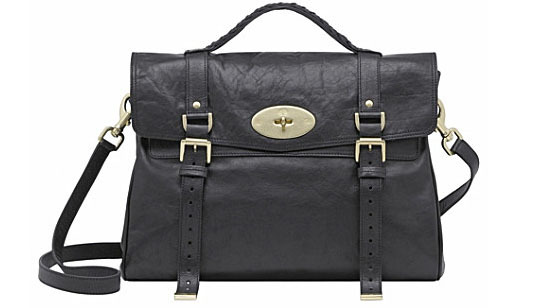 i think every girl would own a mulberry bag if they could afford it - gorgeous! think i've been dreaming about this bag ever since I set eyes on it, it's a beauty! That bag is so lovely, I want a Mulberry bag at some point in my life! This bag is amazing!! I think I want one too now! My mum has an Alexa, I'm constantly jealous of her! Hopefully one day she'll pass it on to me though! This bag is gorgeous. Definitely worth saving the pennies!